At the end of a weekend that went from bad to worse for McLaren Renault, Fernando Alonso salvaged with an 8th place finish after starting from the pitlane. Interestingly though, on the back of McLaren's aerodynamic struggles, he did so with a 2017 front wing. McLaren struggled throughout free practice and qualifying and were nowhere near where they wanted to be. With Vandoorne in 16th, and Alonso required to start from the pitlane after a nose change due to front wing damage on his qualifying run, things didn't bode well either. Vandoorne was soon relegated to a race at the back due to early damage, and he eventually retired with a gearbox problem on lap 65. For Alonso, things came together in the final section of the race after running at the back early on. “I’m very happy – we didn’t expect points today, so that was a very nice surprise. ", said Alonso. “It was a strange race. I started from the pit-lane, was then running 19th after the first laps, then I got stuck behind a group of cars and wasn’t able to run at my proper pace. Also, the front wing we ran was last year’s, so we didn’t know exactly how it would behave with the rest of the aero package." It's been just 7 days since McLaren's Eric Boullier stated that the team had trouble finding out where their aerodynamic issues were. As the problems are not showing up in the wind tunnel, the team is just experimenting with combinations of parts in the Friday practice sessions. Damage to other front wings due to riding hard on kerbs earlier in the weekend left Alonso with no other option but to take a 2017 front wing for the race. It may be an interesting result for McLaren to see that their car wasn't obviously slower than with 2018 parts. “The race was quite chaotic: the hot track temperatures caused a lot of blistering for everybody, but I was able to take care of them and capitalise on that. 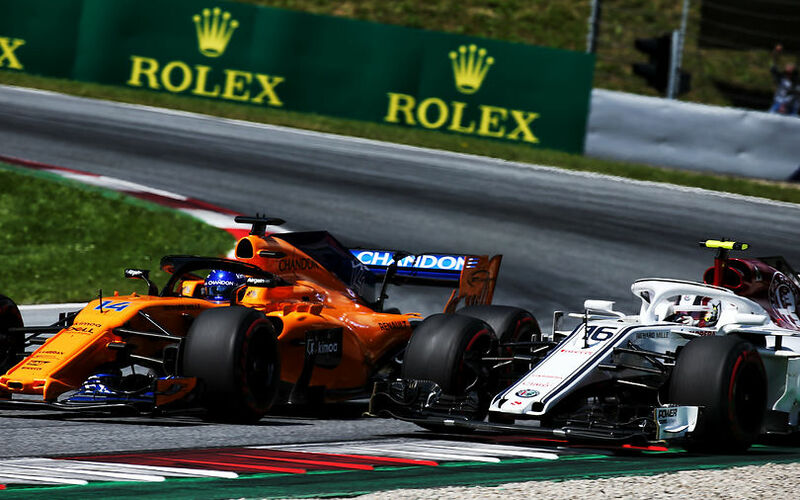 Eric Boullier underlined the race showed once again that the car has more pace that Saturdays usually show, but aligned with Alonso and Vandoorne in admitting that more work was needed to improve on this performance level. "Alonso's pursuit and pass of Charles Leclerc also shows there’s a bit more pace in the car on a Sunday than is usually evident on a Saturday. ", said Boullier. "We’ll keep working to further unlock that.